After two decades on Antiques Road Show, the boys are diving into the classic car business. Unrestored and patinaed exotics are a specialty. Good luck, Gooding. Beware Barrett-Jackson. Creep cautiously, Christie’s. The Keno Brothers are getting into the car auction business. And if the forty bewheeled dreams in their first hoard is any indication, this new business should, in addition to making collectors and international money launderers salivate, provide museum-quality vintage car exhibitions bi-annually. Also, probably set some sales records. The Keno brothers, 58 year-old twins Leigh and Leslie, are best known from their nearly two decades of appearances on PBS Antiques Road Show. On air, the brothers demonstrated a lifelong knack for uncovering, evaluating and appraising early American furniture and decorative arts. But their passion that runs deeper than pinpointing the arcane distinctions between Newport and Philadelphia Chippendale while crushing the dreams of hoarders everywhere. The front of their broad headquarters is almost fully occupied by a trio of rare vehicles. A piebald blue and black 1930 Bugatti Type 44 Fiacre, paying homage in its body (and name) to the horse-drawn carriage. A perfect 1930 Avions Voisin, replete with aeronautic aluminum answers to unasked engineering questions and Escheresque op-art interior. And a perfectly patinated 1954 Jaguar XK120M Roadster, its red leather seat worn raw by generations of racers. The vehicles belong, Leigh tells me to Bradley Farrell, the tattooed COO of their latest venture. Scroll through the lots that will be offered during their first sale in New York this Thursday. At first, you might not see what differentiates Keno Brothers from other auction houses. De rigueur blue chip contemporary cars seem to dominate: Porsche 911 Carrera RS, Jaguar E-type Roadster, Mercedes 300SEL 6.3, Duesenberg SJ, Toyota 2000 GT, Ferrari, Ferrari, Ferrari, any and every Ferrari. But a closer look reveals the Keno brother’s savvy (savant?) attention to detail. It’s there in the perfectly restored cars. Their 911 Carrera RS is an extremely rare, big-engined, lightweight model. Their E-type is the most desirable first-year, flat-floor, welded-louver convertible, in a deliciously recherché mocha brown. 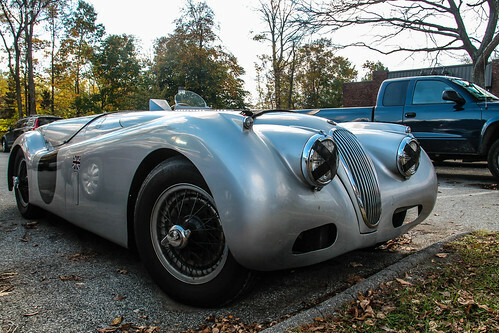 Their Duesey, owned by the wife of an East Coast insurance exec, is one of only three-dozen factory supercharged SJ cars, and spent more time being chauffeured around the continent than it did on Manhattan’s mean streets. Their hot rod Mercedes sedan belonged to none other than Steve McQueen. Another part of the genius is a meticulous attention to detail on the Keno website. Every car has an extensive history and provenance, a dedicated video, a pre-purchase inspection and recent price comps and market analysis. Take their 1953 Ferrari 212 Inter Coupe. Originally purchased by Prince Bernhard of the Netherlands, it not only marks the onset of Maranello’s wooing of playboys and royals, it’s the first of the Ferraris bodied by Battista “Pinin” Farina, whose carrozzeria would go on to design nearly every beloved model thereafter. And the car is grandma’s attic unrestored, crazy-crazed black paint with worn grey leather upholstery. Same for the hotted up 1932 Stutz DV32 Sedan, which lived in a barn for 73 years before coming out to win its class at Pebble Beach in 2012. And the 1931 Bentley 4 Liter, which was the final demo car—used as a tester for the brand—before founder W.O. Bentley lost control of his company. The barn find 1939 BMW 327 Cabriolet is still coated in geological layers of dust. But my favorite un-restored car in the set is the sensuous 1969 Lamborghini Miura S. In part because it’s one of the most gorgeous vehicles ever built, the first mid-engined production supercar. And, in part, because the Kenos were kind enough to toss me the keys and let me plant my Levi’s in the custom wild boar leather interior and my Doc Martens into the seemingly endless travel path of the narrow gas pedal. I tooled around for a half hour or so, unimpeded, snicking the car’s heavy shifter through its metal gates. The Miura’s reputation as a beautiful wheelbarrow is entirely unearned. It is a triumph. Pinch me (or punch me.) I will probably never stop tingling. Preservation cars—those in original and lived-in condition, baring their essence like an aging actresses railing against Botox—are an up-and-coming category of collectibles. They’re unique and personal in a way that a meticulously restored car, its leather dash skins tucked under and engine screw heads aligned in a manner impossible to workers in a Sixties Italian factory, could never be. The Keno Borthers’ first auction, “Rolling Sculpture,” is Nov. 19, 2015 in New York.